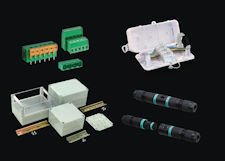 Connectors (couplers, power modules, IEC inlets) | UK Electrical Distributors – E. Preston (Electrical) Ltd.
With the GP21 plug connector and the GS21 socket-outlet, SCHURTER launches the world’s first UL approved IEC TS 62735-1 standardized DC connector system designed to enable efficient DC power distribution in data centre power distribution strips and UPS. To increase operational safety, SCHURTER will also be equipping its 2.6 kW plug with a cord retaining system. 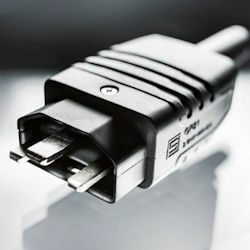 Appliance-side DC components, such as inlets and cord connectors, are being standardized in IEC TS 63236. This standard is currently in the draft phase and is expected to be published by the IEC in 2021. 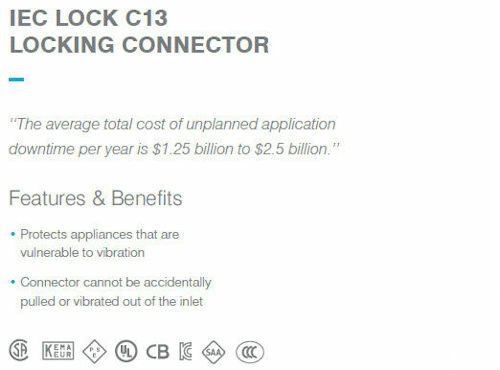 The IEC appliance filter series 5120 and 5123 are now as standard equipped with the V-Lock cord retention feature. 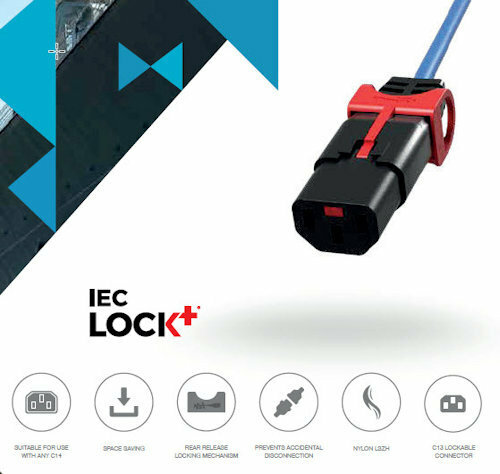 With the V-Lock system, the power connector is equipped with a latch that interlocks with a special notch in the inlet and thus reliably prevents the cord from being pulled out. For the safe operation of systems in data centers, telecommunication or PA-systems, standardized, high grade and automated mounting processes are a necessity. 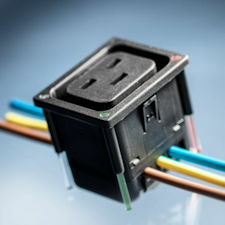 The blocks include 2, 4 or 6 IEC outlets type F, and are prewired and terminated with Quick Connectors 6.3 x 0.8 mm. An asymmetric panel cur-out allows for an efficient mounting process, ensuring proper outlet assembly. The series is certified by VDE and CCC for 10 A at 250 VAC and by UL for 15 A at 250 VAC. For better optical distinction, especially useful in a multi-phase system, the individual blocks can be produced in black, grey and white. 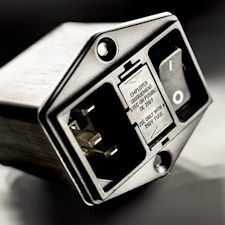 To prevent an inadvertent disconnection of power, the new blocks are compatible with the V-Lock cord retaining system. The snap-in mounting is standard for a 1.5 mm panel thickness. 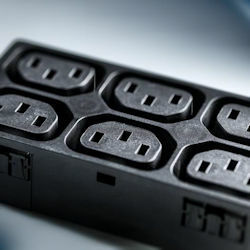 In order to prevent overload of modern power distribution strips with multiple IEC outlets, individual outlets can be protected by means of tamper resistant blind covers. These protective caps are mounted onto the outlets in the power distribution strip just like a plug. For safety reasons, the optionally available protective caps cannot be removed without the special tool/key. With the DG12, Schurter launches its most versatile power entry module with IEC inlet, integrated circuit breaker and a mains filter – with optional IP protection. Thanks to its extremely compact dimensions and a wide range of mounting options, it consolidates discrete power components into one space-saving unit suitable for a variety of applications. The new DG12 filter series from SCHURTER combines an IEC inlet with a TA35 miniature circuit breaker and a mains filter – with optional IP protection. The DG12 is available for almost any mounting variant with snap or screw mounting. In addition, the flange mount version is available in either vertical or horizontal arrangement. 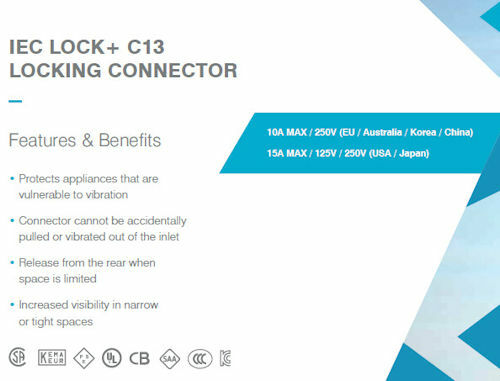 The DG12 has an integrated TA35 bi-pole circuit breaker. It offers the function of a device switch as well as thermal overcurrent protection. The overcurrent protection is available with a bi-metal switching package on one or two poles and with rated currents from 0.05 A to 15 A. The rocker switch is available illuminated or non-illuminated, as well as in a variety of colours and markings. In addition to the standard versions with IP40 protection, the DG12 is available in a version with IP67 seal protection to the panel and circuit breaker. The use of the DG12 in harsh environments with dust or splashing water is ensured with a cover for the circuit breaker, as well as sealing gasket and four sealing screws for fastening the flange. The DG12 series is certified for currents up to 10 A/250 VAC according to IEC standard and 15 A/125/250 VAC UL/CSA standard. The filter series is available in standard or medical versions and for protection class I and II. For applications that require a particularly high immunity to interference, versions with high inductance filters are available. Such applications for example are IT or telecom systems according to IEC 90650, and medical devices according to IEC 60601-1. The series is compatible with V-Lock cord retention connection cables. With the appliance outlets of the 4710-5 series, SCHURTER launches the logical evolutionary step to the successful 4710 – with a clear plus in functionality for status indication. The new 16 A appliance outlet series 4710-5 offers precisely fitted, integrated guides for light pipes. Up to four light pipes can be used to channel LED light from the circuit board. The feature provides a space and cost saving approach to status indication in PDUs, which are used to signal the equipment technician regarding system status. The operation of the LEDs is freely configurable. 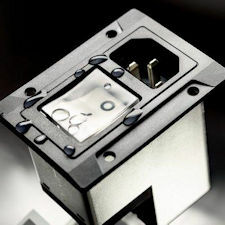 To ensure proper application, the light pipes must be ordered as an accessory and should only be inserted into the power distribution unit after the sockets have been mounted and wired. The use of IDC terminals is particularly efficient. Several outlets can be wired quickly and reliably in a single process step. This highly efficient form of wiring significant reduces assembly time and cost. For individual power supply and status indication, the phase contact is designed as a PCB connection. 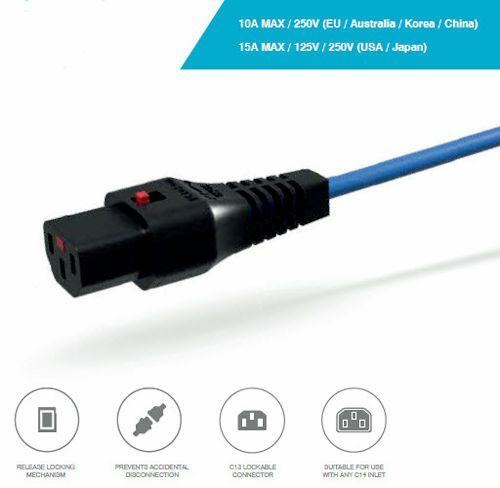 On request, this terminal can also be offered as quick connect or solder terminal. 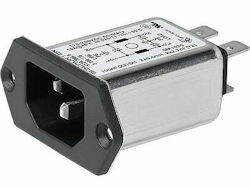 SCHURTER offers the 4710-5 outlets in black, white and grey for multiphase distinction. The 4710-5 series is available in two versions: “along” and “cross” to the pin axis. Selection depends on the design of the PDU and the arrangement of the outlets, vertically (along) or horizontally (cross) one behind the other, thereby properly orienting the wires to the direction of the strip. To avoid unintentional power cord disconnection, the new outlets offer the V-Lock cord retention system. The snap-in mounting of the 4710-5 is designed for panel thicknesses of 1.0 to 3.0 mm. Standard versions are available in 1.5 and 2.0 mm. With its unprecedented functionality and compact design, the new appliance outlet 4710-5 is optimal for intelligent appliances with multiple outlets, such as intelligent PDUs and UPSs used in data centers. With a high degree of mechanical and electrical stability, Bulgin’s M12 X Code connectors provide a cost effective and flexible connectivity solution for onsite installations – helping to decrease downtime in process control, manufacturing automation and industrial instrumentation applications. Schurter extends its successful power entry module series DD12 with new variants for screw and snap mounting. New versions are also available with additional ground choke for suppressing high-frequency interference on the ground conductor. The DD12 with fuse holder, switch and filter offers remarkable functionality in a very compact housing. The DD12 filter series combines an IEC C14 appliance plug with a 1- or 2-pole fuse holder, a 1- or 2-pole switch and a high-quality mains filter. The particularly wide metal flange (horizontal or vertical) make contact with the housing surface over a large area and thus enables an optimum filter and shielding effect. The DD12 series is now available with a ground choke. In addition to the current-compensated choke on the pole and neutral conductor, the line filters have a second choke on the earth conductor. The ground choke is located between the device plug and the filter output. Placing the filter directly at the mains input ensures that possible high-frequency interference currents on the earth conductor cannot bypass the filter via the housing. The versions with medical filters (no Y capacitors) especially benefit from improved asymmetrical attenuation in the higher frequency range due to the earth line choke. The DD12 series is available with standard or medical filter. It is suitable for use in devices that require a particularly high immunity to interference. These include IT or telecom systems according to IEC 90650-1 and medical devices according to IEC 60601-1. The series meets the new fuseholder requirements outlined in IEC 60127-6 for enhanced fire safety and is also suitable for use in home appliances according to IEC 60335-1. It is compatible with V-Lock retaining cordsets. The DD12 series is certified for currents up to 10 A/250 VAC according to IEC standard and 8 A according to UL/CSA standard at 125/250 VAC. It is ENEC and cURus approved.